With eleven members of a family found dead under mysterious circumstances at their home in north Delhi’s Burari locality on Sunday, police said some handwritten notes found during a search of the house suggested the family might have been into some sort of religious practices. The police, however, said it was not immediately clear what exactly the contents of the notes were. The incident has left people living in the area shocked. While ten of those dead were found hanging from an iron-mesh ceiling used for ventilation, the body of a 77-year-old woman was lying on the floor in a different room. The youngest two deceased were aged 15, whose hands and feet were found tied, said the police. All those found hanging had their eyes and mouth covered with cloth and taped. The elderly woman found dead on the floor was however not blindfolded. The police said they were informed by a neighbour that six to seven members of a family had committed suicide. On reaching the spot, they found there were 11 iof them. 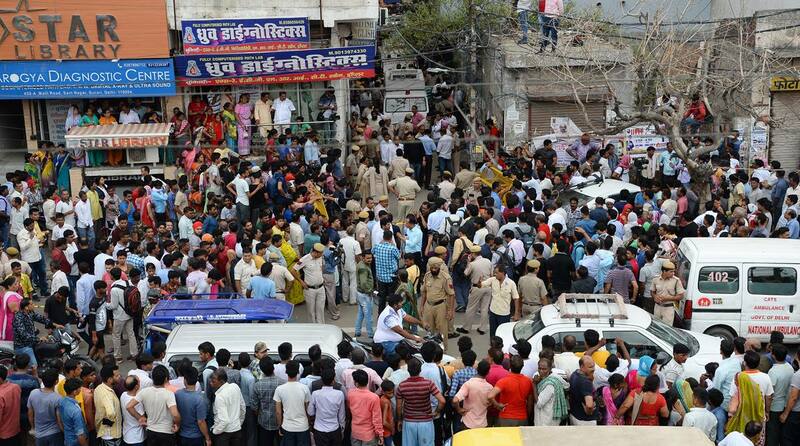 The deceased were Narayan Devi, who was found dead on the floor, her daughter Pratibha (57), two sons Bhavnesh (50) and Lalit Bhatia (45), Bhavnesh’s wife Savita (48) and their three children Meenu (23) and Nidhi (25), and Dhruv (15); Lalit Bhatia’s wife Tina (42) and their 15-year-old son Shivam. Pratibha’s daughter Priyanka (33), who got engaged last month and was to get married by the end of this year, was also found hanging. Bhavnesh ran a grocery store on the ground floor of the house. He would open his shop around 6 am, neighbour Amrik Singh said. “Today, the shop was not opened till 7am. The milk van had arrived outside the shop. A couple of neighbours had gathered becaused the van driver was continuously honking. Then I opened the main gate and went upstairs. What I saw there left me shocked,” said Gurcharan Singh, another neighbour. A senior police officer said the crime branch would investigate the case. The police said they were probing all angles and had not ruled out the possibility of a foul play. Earlier in the day, Chief Minister Arvind Kejriwal and Delhi BJP chief Manoj Tiwari visited the neighbourhood in Burari. “It is a tragic incident. I have spoken to the police. Let’s wait for their investigation to be over,” Kejriwal told reporters. The family was into plywood business and also ran a grocery store. According to area residents, they had been living in the locality for nearly 20 years. A distraught daughter of Narayan Devi’s daughters, Sujata, who lives in Panipat with her family, said there was no reason to believe the family members committed suicide. “I can’t believe that they committed suicide. Everyone was so happy. Someone has killed my family and the police have to find them,” said a distraught Sujata. Neighbours in Burari too refused to believe that it was a case of mass suicide, and said Lalit and Bhupinder were friendly people. “I spoke to Bhupinder last night. He was very happy and there was no sign of any stress,” said one of them. Narayan Devi’s another eldest son Dinesh Bhatia lives in Kota, Rajasthan.